A company decides to shop for a new credit card processing account. So online they go, compile a list of companies, send out an RFQ (request for quote), and wait for the offers to roll in. Maybe they meet with 2 or 3 companies – compare “rates” and play one company against the other trying to get “the best deal”. After many meetings and rounds of quotes- they settle on the lowest “rate” – and pat themselves on the back for doing their due diligence and getting a great rate. The big secret of the Merchant Services world – NONE of that matters in the long run! Sure, you can get a low rate – at the beginning – but for most companies, this is just temporary relief. Before long, they are looking at ever increasing fees, ultimately paying MORE than they were before. How can this be? The open secret is that EVERY merchant services agreement has a pricing change clause. Yep, they tell you, in writing, that they can change your price at ANY time, for ANY reason with a 30-day notice. So ultimately, that low rate that was so exhaustively negotiated, didn’t mean a thing. On the graphic above you can see their fees for the month (A), their Volume (B) and the Promised rate of 0.20% (C). The Effective Rate (price all in after all fees) was 2.91% at the time. 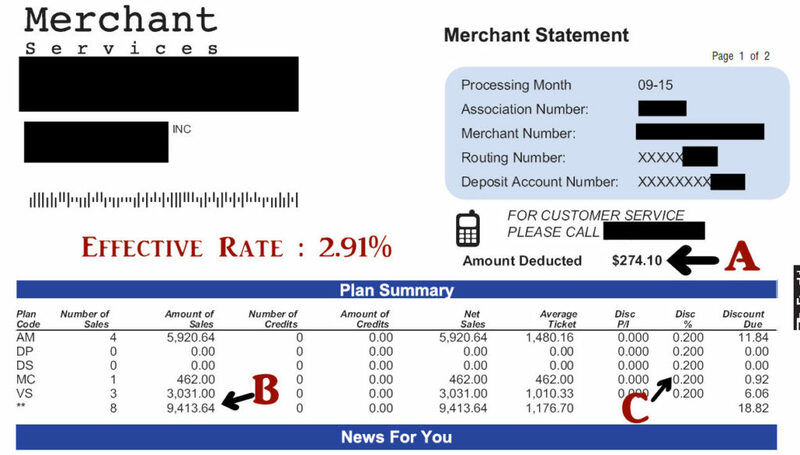 These are card not present (transactions over the phone, fax, or internet) so this was not a bad Effective rate – however, at only 0.20% Markup, it should have been lower – but that is for another article. You can see the Total fees again (A), the Volume for the month (B), and the Promised 0.20% Markup (C) – but WAIT, what is this? The Effective rate is not 2.91% as before, NOW it is 3.49%. How can this be? The Markup didn’t change? Right? – They want you to believe that! The Devil is in the details as they say – There are many parts to merchant services – there are Fees, Dues, and Assessments besides the markup. They can say “markup” didn’t change, while adding more fees and surcharges. “Technically” they can claim they didn’t lie. And before you ask – YES, the BANKS do this too! 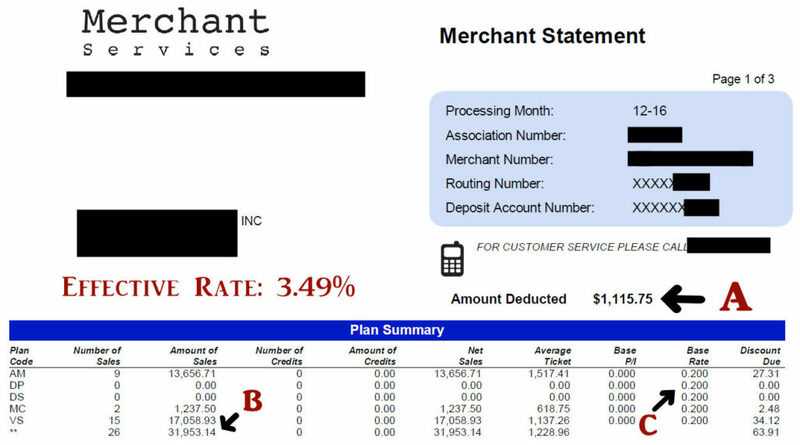 It got worse for this merchant, just a month later; their effective rate was at 3.82%! That’s when they finally called me for help! I was able to show them were their other processor was hiding fees on the statement and provide them with a merchant account that I can monitor for them, so this never happens again! So how can a company protect themselves from these shenanigans? They need a trusted Merchant Services Professional! Shopping for merchant services just based on price can lead a company into a world of issues. I have seen situations that cost companies hundreds even thousands of dollars a month. Ever heard the expression “Penny wise and Dollar Foolish”? Short term savings can lead to long term losses. Remember, it’s not what they quote – It’s what they actually charge that matters. © 2017 Luis Centeno / My Merchant Expert. All Rights Reserved. Merchant Services: The 1 Thing you Need to Know about your Statement! Merchant Services Statements are notoriously difficult to figure out. Most of the confusion is by design. Merchant Services companies don’t want you to realize just how much you are paying for the service. Along with that is a misconception of how the merchant pays credit card processing fees, which is in part an issue of how the service is sold and quoted. “What is your rate?” – I hear this question all the time. The question merchants should really be asking is: “What effective rate can I receive”. So what is an “effective rate”? – It is the percent you pay all in after all fees in your statement are counted. Here is the “secret”. The “rate” most merchants think they are paying, has very little to do with the actual fees being paid. Business owners benefit from knowing what the effective rate is, and how to keep it as low as possible. So let’s go back to effective rate: If you process $50,000 in credit card sales, and your total fees were $1500.00 then you are paying 3% effective rate (1500/50,000=0.03, move the decimal 2 spots to the right and you have your 3%). I can’t tell you how many times I’ve been told by a merchant – “I’m paying 1.70%”, then we do the math, and they are actually paying well over 3%. Their “rate” really was only available for certain transactions, then the extras kicked in – but that is for another article. So what is your effective rate? Do the math and once you know that, do you know if that is a fair rate? The average effective rate is affected by many factors, including credit card volume, ticket average, industry, credit card entry method, and even the customer base. A fair rate – one that won’t change over time, can be very different from industry to industry. It is considered inappropriate in this industry to quote without knowing at least a bit about your business. Although many do quote off the cuff, most true professionals will tell you an effective rate only after careful analysis. Please note that these examples, while true, do not guarantee your business can qualify for similar rates, nor is it a promise to provide processing at those levels. (Our lawyers made us add the last J) We do however, have many examples of these types of results depending on Ticket Average, volume, type of business and method of payment entry. 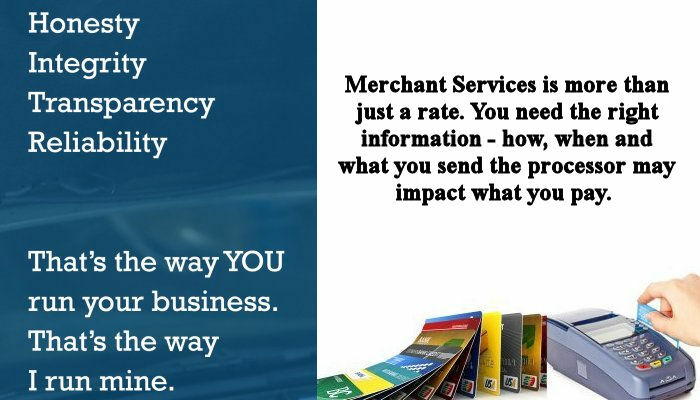 A detailed analysis by merchant services professional can be very beneficial to you – from a Merchant Services Professional you trust. If you would like to know if your effective rate is appropriate for your business and how you can lower it if it isn’t, I am always available to chat. Is the WAY you take credit cards hurting your bottom line? We’ve all heard the adage: Knowledge is Power. This is true in merchant services as much as anywhere else in the business world. If you have taken credit cards in your business before with your own merchant processing account, you know that there are different ways that pricing can be calculated. They are all confusing and there seems to always be surprises. Surprises can come from actions from your Merchant Services Processor, your sales agent, the card associations (Visa/MC/Disc/Amex) or from you, as the merchant. Yes, the way you collect credit card information and send it to the processor makes a difference in your pricing. Your merchant company – that sales/service person who sold you the account should always make sure you know what to watch out for when taking credit cards. Even if you are a small retail store with a regular credit card terminal – you need to know when to enter extra information. For example, Why does the terminal ask for tax sometimes? That usually means someone has given you a business card. The credit card companies give those card holders extra information. To help with that, they ask for information from you. If you enter the right information, you get a better price than you would have gotten if you didn’t enter the information – Well Sometimes. Your processor may not be passing on the savings – but that is another article. The point is you need to know “what” to enter “when” so you can avoid being overcharged. This is even more important in a Mail order/internet or Business to Business situation. Just by changing how the information was provided to the merchant company qualified him for better pricing! He hadn’t been given this information/training before so he was very glad he allowed us the opportunity to help him! The right merchant services professional can help you save in a lot more ways than by just giving you a low rate. Every merchant is different. Contact me if you would like a review of your procedures. In our next article we’ll talk about how a “low rate” is not always as low as you might think. Copyright © 2019 ·My Merchant Expert, Inc. · Luis Centeno. All Rights Reserved.